Lamivudine was approved for use in Europe in August 1996. This was the fifth drug from the group of NRTIs, is an analogue of cytidine. Lamivudine is well tolerated and is a part of different combined drugs. 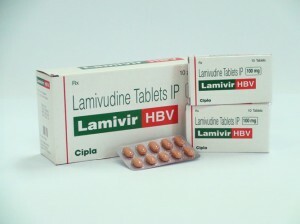 The main disadvantage of lamivudine is that HIV rapidly acquire resistance to it – just a single point mutation M184V. Resistance to lamivudine can be formed within a few weeks. Therefore, the total effect of antiretroviral lamivudine appears only in combination with other NRTIs. In large clinical studies such as NUCB 3002 and CAESAR, has been proven clinical benefit from the addition of lamivudine in the scheme on the basis of NRTIs. It is noteworthy that the binding M184V mutations in the virus population even brings some benefit: firstly, sometimes resulting in a mutation of the individual strains resistant to AZT HIV regain sensitivity to it, and secondly, this mutation reduced the replicative capacity of the virus.